The genus Perkinsus includes protozoan parasites of marine molluscs in many different locations around the world. Infection may be associated with high mortality rates. Two species, Perkinsus marinus and P. olseni, are given particular attention because of their impact on aquaculture. 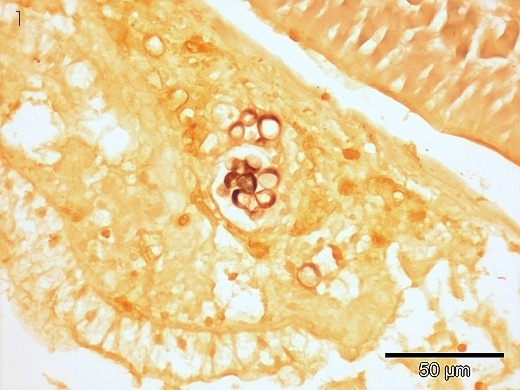 Ruditapes philippinarum (H&E staining, objective 10). 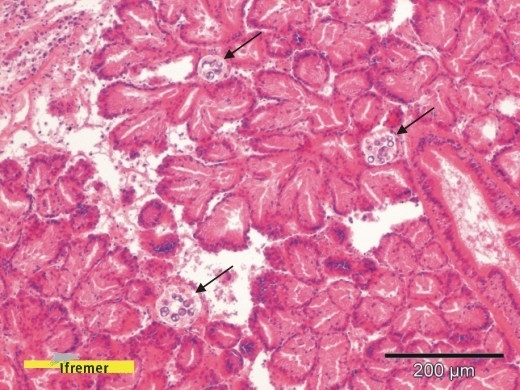 Picture : Perkinsus olseni cells (arrows) located in the connective tissue of the digestive gland from a Manila clam Ruditapes philippinarum. Considering the geographical distribution of Perkinsus olseni, occurring from Pacific Islands through Australia, Southeast Asia, to Europe and to Uruguay and its large host range (clams, oysters, cockles, abalones), one could wonder if this pathogen fulfils OIE listing criteria. However, within the geographic range of P. marinus, differences in virulence between isolates were demonstrated, suggesting that several strains of this parasite might exist with differences in genetic composition, geographic distribution and virulence. Similarly, variability in the pathogenicity of Perkinsus olseni raises questions on the existence of types or strains of the parasite or differences in host responses under different environmental conditions. Since 2008, the EURL has participated in the characterization of parasites of the genus Perkinsus detected in different clam production areas in France and in some other locations from the Mediterranean Basin. Initially, a study was carried out in France to characterize parasites of the genus Perkinsus present in clams. Clams were collected in different locations along the French coasts in 2004 and 2005. 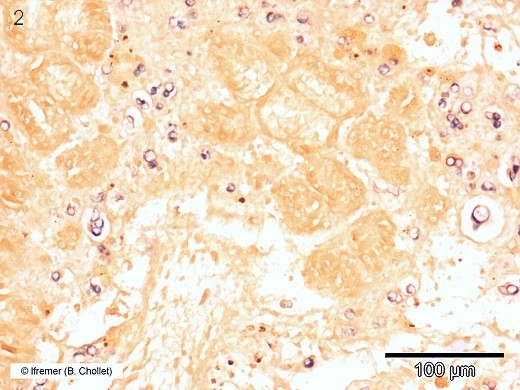 Parasites of the genus Perkinsus were detected and quantified by thioglycolate culture medium. Molecular characterization was done by PCR-RFLP targeting the ITS region. PCR products selected according to their restriction profiles were subsequently cloned and sequenced in order to check potential co infection within clams. Perkinsus olseni was detected in all the French investigated producing areas. However, in Leucate lagoon (South of France) and in Bonne Anse (Middle Atlantic French coast of France), PCR-FRLP results revealed restriction profiles similar to P. chesapeaki (see pictures below). 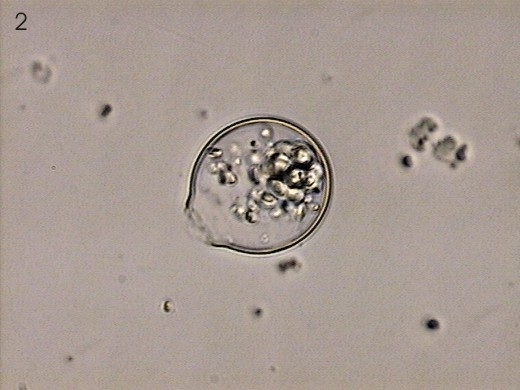 These results were confirmed by sequencing three different parts of the parasite genome (ITS, actin and LSU) and by testing some clams by in situ hybridization. 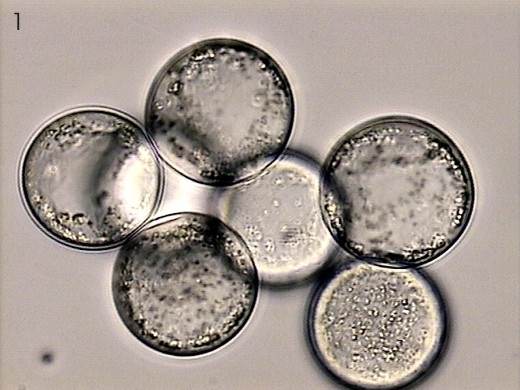 These results were completed by some description of some cellular cultures. Pictures: Trophozoites (1) and zoosporangium (2) of Perkinsus chasepeaki isolated from Ruditapes decussatus from Leucate lagoon (Mediterranean coast, France) and cultivated in DMEM:HAM'S F12 medium (pictures B. Chollet). In situ hybridization tests were indicative of the presence of both parasites P. olseni and P. chesapeaki in the tissue of some clams (see pictures below). Pictures: In situ hybridisation test of Ruditapes decussatus from Leucate lagoon, (1) using the probe PchesLSU-485DIG specific of Perkinsus chesapeaki (Reece et al. 2008) and (2) using the probe PolsLSU-464DIG specific of P. olseni (Moss et al. 2006). Pictures B. Chollet. Our results show that these two species are sympatric in at least two French areas and raise the question of the presence of Perkinsus chesapeaki (a parasite only detected in North America up to now) in France and maybe in Europe. Arzul Isabelle, Chollet Bruno, Michel Justine, Robert Maeva, Garcia Céline, Joly Jean-Pierre, François Cyrille, Miossec Laurence (2012). One Perkinsus species may hide another: characterization of Perkinsus species present in clam production areas of France. Parasitology, 139(13), 1757-1771.